Some progress update… The flower motives are merrily blocking (my blocking pad looks just disgusting from heavy usage – various yarns have lent their colours to it). 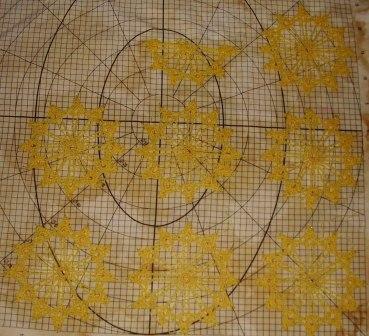 The flowers have grown slightly in size after blocking. 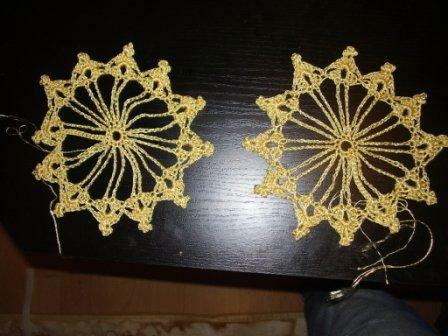 This worries me a bit, in terms of how I manage this adjustment when filling the space with the crocheted irregular net. I guess I’ll have to do it very tightly, to the point when it’ll pull a bit, so that it eases into right shape and size after the final blocking. I’ve also made the life-size paper model of the dress. After all the motives will dry, I’ll use it to see if I have enough (so far 12 and one 1/2-circle), or if have to make some more. Separator image Posted in My kniting & crochet and tagged with beach dress, blocking, crochet, free patterns, freeform, irish lace, tatiana akimenko.